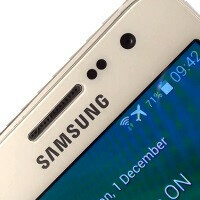 Italian website HDBlog published the world's first hands-on with the upcoming Samsung Galaxy A3. Thanks to their great work, we're getting a short, but fulfilling look at the lowest tier in Samsung's new A series of phones. There aren't too many surprises to be had here, but we do like what we're seeing! The Galaxy A3 is modelled after the Galaxy Alpha's design language, which means it features a real, honest to God sculpted metal frame. Unlike the Alpha, though, the A3 doesn't have the dimpled back, which, according to our humble opinion, is a more sophisticated look. The Galaxy A3's 4.5-inch 540p S-AMOLED display looks okay in the video. It's not the sharpest low-end display out there, but the 245ppi pixel density is decent, and you have to look hard for those pixels to really bug your eyes. The viewing angles look acceptable for this device category. However, the video compression doesn't really allow for precise judgements, so feel free to make your own observations. As evident, the Galaxy A3 runs Android 4.4.4 KitKat topped of with Samsung's latest TouchWiz UI that you'll see in the Galaxy Note 4. Functionality such as My Magazine, Ultra power saving mode, and Private mode is present here, as is the revamped interface. The smartphone is ran by a quad-core 64-bit 1.2GHz Qualcomm processor, the Snapdragon 410, paired with 1GB of RAM. There's 16GB of expandable storage and a 1900mAh battery. Although the Galaxy A3 is arguably the best "low-end" Android smartphone Samsung has produced, we believe the company will try to market it as a model from a "premium" series, which it probably won't be as affordable as it has to be to compete with the likes of Xiaomi and Meizu that have occupied the Chinese market. However, the A-series devices have a fair chance at competing with the iPhone 5S and iPhone 6 in Western markets. At the very least, this is a move in the right design and specs direction from Samsung. Check out some screencaps in the gallery, and watch the video below if you want to see the Galaxy A3 in motion. Device looks good but specs are too low. Esp just a GB of RAM. Should have gone for 1.5GB atleast. Also should have gone for atleast 2200mAH battery. anyways looking forward to how much overpriced it would be! it'll be good as backup phone, but you're right, it'll be overpriced from what it offers, they should price it right, tho the design is beautiful and perfect as a back-up phone, the price will be the factor. At that price point one shouldn't really be complaining about bezels. Moto G and all other similarly priced phones have reasonably more bezels. why have they made this? Its Samsung. Thats what they do. You forgot to mention that the back is metal... Not just a metal frame. Sammy had overpriced their plastic devices, how nuch more for this? Sammy's on a downhill. Wait for the price,it's going to blow you out of the waters..
That build quality looks amazing. Still got nothing over my Note 4 huehue.